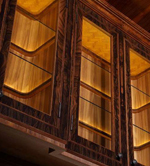 Since 2005, Veneer Technologies Incorporated has sponsored the Veneer Tech Craftsman’s Challenge™, the prestigious competition rewarding designers, craftspeople, students, distributors and sales representatives for excellence in woodworking that features natural veneer and wood applications—regardless of the source of the material. This is Veneer Tech’s way of recognizing the entire supply chain as well as the individuals whose creations inspire the marketplace and fuel our segment of the world economy. Impartial judges from all reaches of the industry select winning entries that use veneer products in the best way while achieving the entrant’s goals. Hundreds of designers and craftspeople have entered their top work, including the best-known mentors, studio masters, architectural firms and representatives of leading woodworking educational institutions and programs. In addition to cash awards, winners are afforded valuable publicity. All entrants are showcased on this website in our Craftsman’s Challenge gallery. Competition results are announced at the premier trade show venues, being IWF-Atlanta in even numbered years and alternating with the AWFS® Fair in Las Vegas. The Veneer Tech Craftsman’s Challenge is co-sponsored by FDMC, formerly known as CabinetMaker+FDM.